After listening to years of security advice, many of us now use different passwords to access various websites. Problem is, how do you store and synchronize this data across your devices? You can’t remember every unique password. The secret is a password manager which enables you to store a central 'master password' (which you can remember) and then gain access to this securely stored data on any supported device. Problem is, can you trust a centralized password manager after previous security issues? 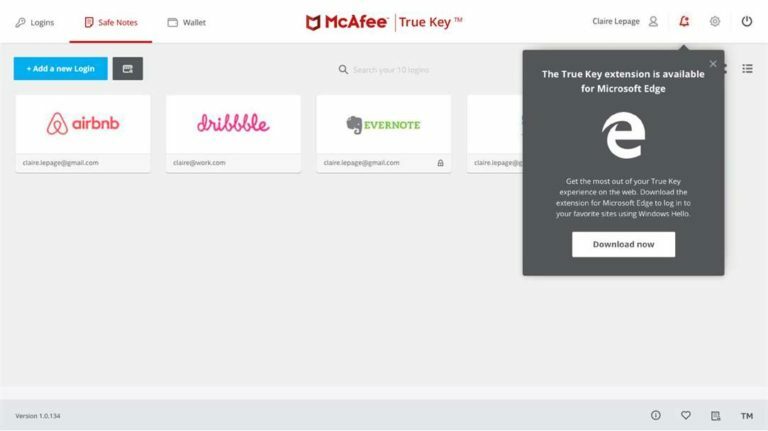 True Key by McAfee is a central password manager from an established security developer (McAfee is owned by Intel) and it offers a unique way of gaining access to your stored passwords: in addition to a central 'master password', True Key offers facial and fingerprint recognition. Sort of. More about that later. True Key looks well designed. You can install on your Mac or PC or for iPhone/iPad and your Android device. It offers full support for Chrome, Firefox, Edge and Internet Explorer. But not Safari and this is a problem for Mac users as the browser plugin won’t enable access via the default browser. Luckily under iOS 12, you can access True Key separately from your browser and access your passwords, whether you use Safari, Chrome or another iOS browser. In addition to storing your website login/passwords, you can use True Key to store your important notes, credit cards, ID information and anything else you need to access from your computer or smartphone, but want to be secured. Which comes to our next issue. Access. True Key enables you to login using face recognition, which didn’t work on our desktop, after multiple attempts (you can also login using a fingerprint using your smartphone). It claimed it had successfully stored our face, but it wouldn’t recognize us via our webcam when we wanted to log back in. Not a great start. Of course, you can fall back to your master password. The free version of True Key will only store 15 logins/passwords, which is very limiting. You’ll need to purchase the Premium version which is $19.99/year. This will store up to 10,000 logins/passwords. Download McAfee True Key for Mac or PC or for your iOS and Android devices.